RSVP set for the Bloom Wedding Invitation. A1 also called 4 bar size (5"x3.5") RSVP card is 100% recycled yellow cotton rag paper with recycled white envelope made in USA. If you are printing, you get 4 cards on the sheet we send you. (Templates included). Paper is cut to size if we print for you. Sunny Yellow Letterpress Booklet made from handmade cotton rag paper. DIY Wedding Invitation Kit. 100% treefree and recycled materials. Letterpress printed cover in orange ink with original design. Booklet is diecut and scored. Elegant pocket for rsvp set or enclosures. Booklet style invitation sheet - perfect for 2 language wedding invitations. Bound with length of orange paper raffia. Kit includes everything you need to make the DIY process easy. Booklet opens to a wide landscape format, measuring 13 inches x 4 1/2 inches. You can print laser or inkjet, or WE CAN PRINT for you, offset. Mails completely flat in a bright white cotton A7 standard size envelope, If you tie the binding raffia in a knot -- there is no USPS "bump" 20 cent charge. 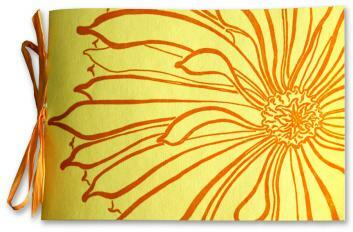 Beautiful cotton rag handmade paper in bright yellow with original design letterpress printed in rust orange ink. ECO PAPER FACTS: Portfolio wrapper made from recycled cotton rag handmade paper from India. Diecut and letterpress printed here in Pasadena. Inside invitation sheet made of bright white cotton paper that prints beautifully. Envelopes made from recycled or cotton linter fiber, made in USA by Crane papermillls. Letterpress printed using vegetable inks (flax oil). Envelope: Bright white RECYCLED paper envelope. Colors: Bright yellow, orange and bright white. Invitation Sheet:Bright white cotton rag paper. Prints laser or inkjet. Envelope:Bright white recycled A7 standard size. Tie:Half yard of orange paper raffia.